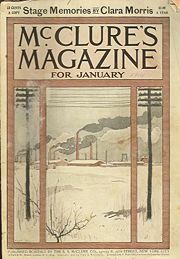 McClure's Magazine (cover, Jan, 1901) published many early muckraker articles. A muckraker is a journalist, author, or filmmaker who investigates and exposes issues that are generally shocking to the public. Generally, muckraking tends to be targeted at forces in power and the established institutions of society, often in a sensationalist and tabloid manner. Given their name by Theodore Roosevelt when he likened their work to the man with the muck-rake in John Bunyans' Pilgrim's Progress, the task of such writers is to expose the problem (the "muck") without always looking down and becoming ensconced in the filth themselves. Thus, while the American attribution has a generally positive connotation, implying a valuable contribution to society by shedding light on the violations of expected standards, British "muckrakers" are reviled as being as dirty as the evils they expose to the public. To make a valuable contribution to society, the muckrakers need to maintain a higher standard than that of those they expose. 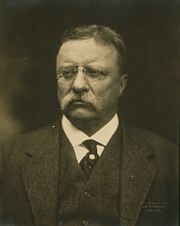 U.S. President Theodore Roosevelt coined the term 'muckraker' in 1906. A muckraker is an American English term for one who investigates and exposes issues of corruption. They expose violations of widely held values, such as political corruption, corporate crime, child labor, conditions in slums and prisons, unsanitary conditions in food processing plants (such as meat), fraudulent claims by manufacturers of patent medicines, labor racketeering, and similar topics. In British English however the term is applied to sensationalist scandal-mongering journalist, not driven by any social principles. President Theodore Roosevelt is attributed as the source of the term "muckraker." During a speech in 1906 he likened the journalists to the Man with the Muckrake, a character in John Bunyan's Pilgrim's Progress (1678). the Man with the Muck-rake, the man who could look no way but downward, with the muck-rake in his hand; who was offered a celestial crown for his muck-rake, but who would neither look up nor regard the crown he was offered, but continued to rake to himself the filth of the floor. 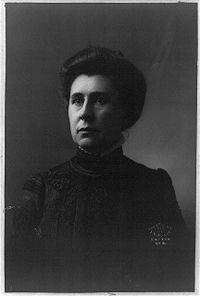 Ida M. Tarbell, American "muckraker"
The term "muckraker" is most usually associated with a group of American investigative reporters, novelists, and critics from the late 1800s to early 1900s, but also applies to contemporary persons who follow in the tradition of those from that period. Although the term "muckraking" might appear to have negative connotations (and does in British society), muckrakers have most often sought to serve the public interest by uncovering crime, corruption, waste, fraud, and abuse in both the public and private sectors. In the early 1900s, muckrakers shed light on such issues by writing books and articles for popular magazines and newspapers such as Cosmopolitan, The Independent, and McClure's. Their sensationalist style grew from the yellow journalism of the period. The rise of muckraking in the late nineteenth and early twentieth centuries corresponded with the advent of Progressivism yet, while temporally correlated, the two are not intrinsically linked. Some of the most famous of the early muckrakers are Ida Tarbell, Lincoln Steffens, and Ray Stannard Baker. Exhibit featuring Ralph Nader's book at Henry Ford Museum, Detroit. An example of more recent muckraker work is Ralph Nader's Unsafe at Any Speed (1965) which led to reforms in automotive manufacturing in the United States. Nader's publication led to a stop in the production of the Chevrolet Corvair, one of the first rear-engine American cars. Nader exposed safety issues inherent in the design, implying that the manufacturers cared only for profit and not for the lives of their customers. The book detailed claims of resistance by car manufacturers to the introduction of safety features, like seat belts, and their general reluctance to spend money on improving safety. It was a pioneering work of consumer advocacy, openly polemical but containing substantial references and material from industry insiders. The discontinuation of the Corvair was controversial, however, because many believed the innovative style could have been altered for safety and could have spurred the American automobile industry to produce better products. Other late twentieth century muckraking-type exposes include the work of Washington Post journalists Bob Woodward and Carl Bernstein that led to the Watergate scandal and the downfall of President Richard Nixon, and columnist Gary Weiss's work describing how Wall Street firms were infiltrated by organized crime figures during the 1990s. Muckraking has continued into the twenty-first century, exemplified by Eric Schlosser's Fast Food Nation: The Dark Side of the All-American Meal (2001) that examined the local and global influence of the United States fast food industry. This book has drawn comparisons to Upton Sinclair's classic muckraking novel The Jungle. Ray Stannard Baker (1870 – 1946) Following the Color Line, became the first prominent journalist to examine America's racial divide. Nellie Bly (1864 – 1922) Ten Days in a Mad-House. Barbara Ehrenreich—journalist and author, Nickel and Dimed: On (Not) Getting By in America. Joshua Micah Marshall—writer and journalist, launched the muckraking blog TPM Muckraker, responsible for helping to break the 2006-2007 US Attorney firing scandal, the Duke Cunningham corruption case and others. Michael Moore—documentary filmmaker, director of Roger and Me, Bowling for Columbine, Fahrenheit 911, and SiCKO. Ralph Nader—consumer rights advocate; Unsafe at Any Speed (1965), exposed unsafe automobile manufacturing. Jack Newfield—muckraking columnist; wrote for New York Post; and wrote The Full Rudy: The Man, the Myth, the Mania [about Rudy Giuliani] (2003). David Graham Phillips (1867 – 1911) wrote an article in Cosmopolitan in April 1906 on "The Treason of the Senate," exposing campaign contributors being rewarded by certain members of the Senate. This and other similar articles led to the creation of the Seventeenth Amendment to the Constitution, which provides for the direct election of Senators by the people of a state rather than their appointment by a state legislature. Jacob Riis (1849 – 1914) - How the Other Half Lives, about the slums. Eric Schlosser—author of Fast Food Nation, an exposé of fast food in American culture. Upton Sinclair (1878 – 1968)—The Jungle (1906), U.S. meat-packing industry, and the books in the "Dead Hand" series that critique the institutions (journalism, education, etc.) that could but do not prevent these abuses. Morgan Spurlock—American Filmmaker; exposed through example the dangers of McDonalds in his documentary Super Size Me. Lincoln Steffens (1866 – 1936) specialized in investigating government and political corruption, two collections of his articles were published as The Shame of the Cities (1904) and The Struggle for Self-Government (1906). Ida M. Tarbell (1857 – 1944) expose The History of the Standard Oil Company. Hunter S. Thompson (1937 – 2005)—American journalist and author credited with the invention of gonzo journalism. Gary Webb (1955 – 2004)—investigated Contra-crack cocaine connection, published as Dark Alliance (1999). Gary Weiss—American investigative journalist, columnist, and author of two books that critically examine the ethics and morality of Wall Street, named "Muckraker" columnist for Forbes.com. Bob Woodward and Carl Bernstein—breakthrough journalists for Washington Post on the Watergate scandal; authors of All the President's Men, non-fiction account of the scandal. This page was last modified on 2 April 2008, at 12:44.